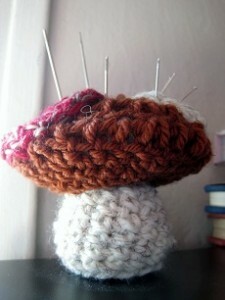 This little mushroom is a versatile little project perfect for a lazy summer day. Use your mushroom as a pin cushion, a fun decoration or embroider a little set of eyes on the stem to make it a cute little amigurumi! Also, feel free to experiment with different colors, an orange stem, pink top and bright yellow spots would be very exciting! Break off and stuff stem. It works well to stuff the very bottom of the stem with something heavier like pebbles, lentils or dried beans and then stuff with regular polyester fiberfill on top of that. Break off, leaving a tail at least 6″ long. Lightly stuff cap, sew to stem with tail. Break off, leaving a tail at least 6″ long, pick a good spot and sew spot to mushroom cap. Have any questions or comments on this pattern? Please comment away! This entry was posted on Friday, May 20th, 2011 at 1:35 PM by Erin Burger	and is filed under Free Crochet Patterns. You can follow any responses to this entry through the RSS 2.0 feed. You can leave a response, or trackback from your own site. Super Cute! I like the idea of putting eyes on him. It would be cool for my oldest nephew who plays a lot of video games! Ah! This is so adorable!